I certainly don't feel like cooking today nor do I have a lot of time to be doing it. I'm battling a cold and trying to get my house in order for Christmas. These tostadas made the perfect quick and easy dinner. 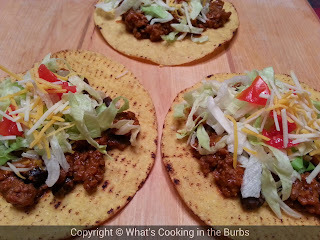 I love how versatile they are and you can add whatever toppings you would like. They were an instant hit with the family! Brown meat in large skillet. Add chili powder, cumin, and garlic powder. Stir well and then add in the beans and salsa. Cook for five minutes or until heated through, stirring occasionally. Remove from heat. Stir in half the cheese. Spread meat mixture onto tortillas; top with remaining cheese, lettuce, tomatoes, green onions, and sour cream. Enjoy!